Berries are definitely in season, so I decided to make two berry tarts. 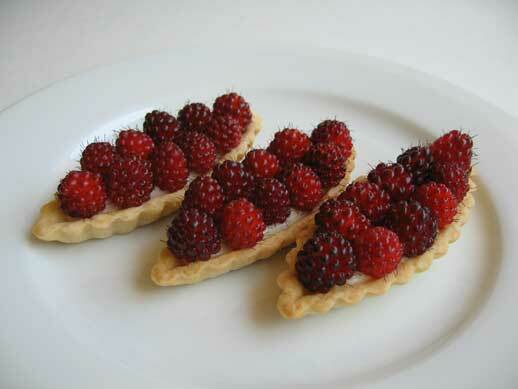 The tarts are composed of pâte sucrée dough, a vanilla pastry cream and topped with fresh berries. These tarts make a simple and satisfying summer dessert. The raspberries were picked from Philippe’s garden and the salmonberries were picked with the help of my two nephews and niece, during a recent trip visiting them on Vancouver Island. 1. Place the flour and sugar in the bowl of a food processor, and process for a few seconds to combine. Add the butter pieces to the flour mixture, and process until the mixture resembles course meal, about 10 seconds. In a small bowl, lightly beat the egg yolks and ice water. Add egg-water in a slow steady stream through the feed tube, with the machine running, just until the dough holds together. Do not process for more than 30 seconds. 2. Turn the dough out onto a work surface. Divide into 2 equal pieces, and place on 2 sheets of plastic wrap. Flatten, and form two disks. Wrap, and refrigerate at least 1 hour before using. Makes two 11-inch tarts, two 9-inch tarts, or two 8-inch tarts. This pastry dough may be stored in the freezer for up to 1 month. Defrost by refrigerating overnight or letting stand at room temperature for 1 hour. 1. Combine the eggs, yolks, and 1/2 cup sugar in the bowl of an electric mixer fitted with the whisk attachment. Beat on medium-high speed until the mixture is pale yellow and thick, about 5 minutes. Turn off the machine. Sift in the cornstarch; beat on medium-low speed until combined, scraping down the sides of the bowl with a rubber spatula. 2. Prepare an ice-water bath; set aside. Combine the milk, the remaining 1/4 cup of sugar, and the vanilla bean and seed scrapings in a medium saucepan, and bring to a boil. Remove from the heat, and discard the vanilla bean. Whisking constantly, slowly pour half of the hot milk mixture into the egg mixture; whisk until smooth. Pour the mixture back into the saucepan with the remaining hot milk. Set over medium heat, and whisk until the mixture reaches the consistency of pudding, 2 to 3 minutes. 3. Transfer the mixture to a large bowl. Add the butter, 1 tablespoon at a time, stirring until melted and incorporated after each addition. Place the bowl over the ice bath, stirring occasionally, until chilled. Cover the surface of the pastry cream with plastic wrap to prevent a skin from forming; let chill overnight or at least 11/2 hours before using. Makes 3 cups. This will fill two 9-inch tart shells, three 3 x 14-inch rectangles, or up to four-dozen 3-inch tartlets. It can be made ahead and chilled for up to 3 days. Posted by Sam at 12:48 a.m. Ever had the orange salmonberries? they're much sweeter than red, I think. 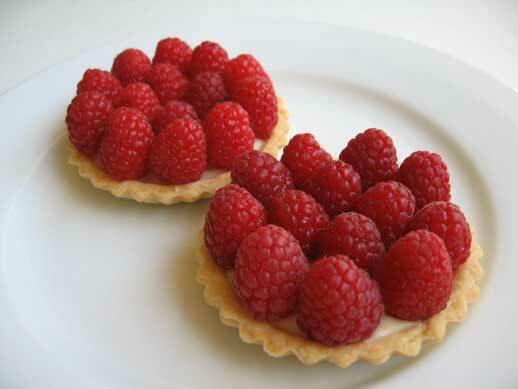 The tarts look scrumptious! I really shouldn't be looking at these so early in the morning. It's dangerous. These look amazing. Just beautiful! Look at all those lovely raspberries ... enjoy them while they're in season! What do salmonberries taste like? This looks stunning. I have a newfound love for tarts. What exactly are salmon berries by the way? I have had both orange and red salmon berries. I think both can be sweet. Thanks! Thanks RS, I hope that you are having a wonderful summer. I am definitely trying to enjoy all the wonder things that are in season and in Philippe's garden. Cheers. A cross between a blackberry and raspberry, they are closely related. The colour of salmonberries are amazing!